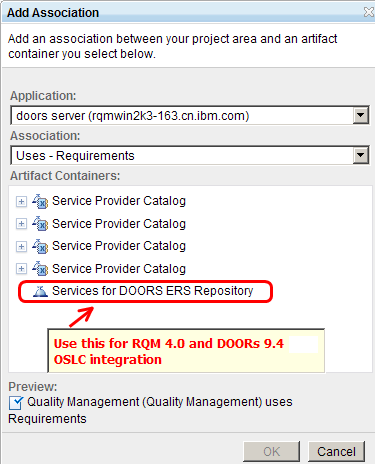 This article explains how to configure Rational Quality Mananger (RQM) and Rational DOORS so that they integrate with one another using Open Services Lifecycle Collaboration (OSLC), an open standard that IBM is developing in cooperation with business partners and customers. You can use Rational DOORS to manage your requirements, and you can use Rational Quality Mananger to track requirements from Rational DOORS with test artifacts. The integration will create live and bi-directional association between test artifacts in RQM and requirements in DOORS, and it can provide real-time lifecycle traceability between the two products. In addition, you can use the reconciliation function in RQM to reconcile test plan coverage with the requirements in DOORS and get the latest requirement status, like changing or deleting, and it can help you update test plans and test cases quickly and accurately by responding to requirement changes. Rational DOORS 9.4 is installed and the server is already configured. Also that the DOORS client is installed and connected the DOORS database. Rational DOORS Web Access 1.5 is installed. The Rational Team Quality 4.0 server is already set up. This section explains how to configure components of Rational DOORS Web Access (DWA) and Rational DOORS which are needed for the OSLC integration. In order to configure DWA to provide OSLC services, you need to Enable Data Change Notifications which is used for the communication of DOORS and DWA. Also, you need to redirect DOORS resource url to OSLC style. Restart the DOORS database server from Services. Note: If you can’t successfully config DWA DCN and Redirector URL, the integration of the RQM and DOORS will meet a lot problem liking you can be able to associate DOORS requirement to RQM test artifacts succssfully, you need to double check whether the configuration is correct or not. Make a note of the DWA host . You need it when you config OSLC friends. Make sure you have configuration the DOORS database server to communicate with DWA broker and DWA server correctly. The Broker URI has changed. If you can’t see so many -I- DBADMIN, You may have some wrong type of the cmd, please don’t copy directly of the cmd as you may meet transcoding problem. In order to configure DWA to provide OSLC services, make sure Rational DOORS server is installed and is up and running. Start the Rational DOORS client pointing to the running DOORS server. In both the User ID and Password fields, type Administrator. Click Tools > Edit DXL. Type print getDatabaseIdentifier() and click Run. Make a note of the database URN. You need it when you are modifying the Rational DOORS Web Access configuration files. Modify the repository URN (using the database URN that you copied earlier). Replace localhost with the IP address of the DOORS license server. Replace “false” with “true” in display.redirector.urls. Replace MYHOSTNAME with FullyQualified Hostname of the machine where Rational DOORS Web Access Server is running. Replace oauth.domain value to “https://FullyQualifiedHostnameofDWAserver:PortNo/dwa”. Go to <DWA install directory>serverfestivalconfig folder. Replace “MY_DWA_HOSTNAME” in the file with the fully Qualified Hostname of DWA server. Put the keystore file inside the ssl folder. Go to <DWA install directory>serverconf and open server.xml. Note: Please make sure that KeystoreFile location matches with location of certificate. If you can visit the Non-secure DWA successfully by http://FullyQualifiedHostnameofDWAsever:8080/dwa, but can’t visit the secure DWA, please check whether you have correct configuration the DWA to enable ssl. If you can open DWA page but no any response when log in, please check whether you have started the Interop server. Go to the Application tab and under Communication select Consumers (Inbound). Under Register Consumer, complete the fields and generate an authorized OAuth consumer key. Note: You can generate a consumer of your choice by selecting Click here to pick the consumer key instead. Take a note of the consumer key that was generated, and the OAuth Secret code. Login to Rational DOORS as the Administrator user. Select the DOORS database in the left pane and click File > Properties. Click the Remote Services tab. In the Server List pane, click Add, and complete the fields using the Consumer Key and OAuth Secret generated on the RQM Server side in the previous step. Click Register. The QM server should be added to the list on the Server Lists window. In the Collaboration Links pane, click Add. Select the newly added server from the dropdown list, login if prompted, then browse to the target project and select the ValidateBy link. Click Add to complete the collaboration link. Click OK in the Remote Services. In Rational DOORS, select the DOORS Database in the left pane and click File > Properties. Select the Local Key tab. Click Add, complete the fields and register the consumer. In the RQM admin server page, add the consumer you have just created in Rational DOORS as a friend on the Friends (Outbound) page. Go to the Project Area section. Create a project or select any available project to link the DOORS service provider catalogue or sub-catalogue. From the Application list, select the registered DWA service provider. From the Association list, select Uses-Requirements. Click OK and save the project. If you select Services for DOORS ERS Repository as the service provider, you will be able to add any module or view in the current DOORS server as requirement collection to Rational Quality Manager test plan and any requirements in the current DOORS server to Rational Quality Manager test case or test script. If you select the service provider under Service Provider Catalog, then you will not be able to add the corresponding view or module and its child view or modules to a test plan since it is not supported by DOORS. Once you try to add a DOORS view or module to RQM test plan using the service provider under Service Provider Catalog, you will get a warning message “Not supported”. To make sure RQM and DOORS integration works well, please do not use this type of service provider in the current release. Shi Lei is the RQM feature lead of RQM and DOORS integration using OSLC in China Software Development Lab. She can be contacted at shilcdl@cn.ibm.com.